Leo Scullion “couldn’t be any happier” after being chosen to referee snooker’s World Championship final for the first time. The Scot, 60, has been a professional referee for 20 years and was treated for lung cancer in late 2014. 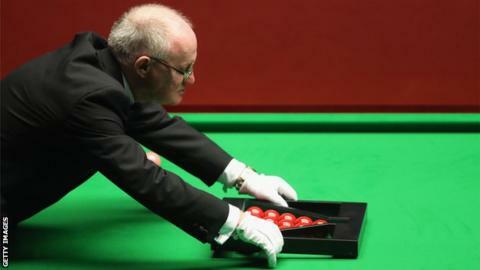 The tournament at Sheffield’s Crucible Theatre starts on 20 April culminating in the final on 5 and 6 May. “It’s fantastic, absolutely fantastic, it has to be the pinnacle of any referee’s career,” Scullion said. Scullion was forced to take a break from his refereeing career while he underwent treatment, including two cycles of chemotherapy. The cancer has now been in remission for nearly five years, with Scullion able to return to the tour in 2016. He said: “In those dark days, I suppose one of the things that would’ve been on my mind, although not immediately, was would I ever be back refereeing never mind being chosen to do this? Scullion, a former policeman in Glasgow, started refereeing at amateur level in the mid-1980s and has officiated at three World Championship semi-finals.